Unique Group’s On-Site Engineering division, through its Wellube brand, effectively performed the On-Line Steam Leak Sealing for Abu Dhabi Gas Liquefication Company (ADGAS). The service was performed on the 2.4 meters OD heat exchanger flange leak along the pipeline. It’s design parameters were 434 degrees Celsius at 60 bar. ADGAS established in 1973, was the first LNG production company in the Middle East and North Africa region. It is known as a clean energy producer with a long history of reliability, expertise and a long-established tradition of environment awareness and concern. As of late, ADGAS is actively involved in the Offshore Associated Gas project and the Integrated Gas Development project, to be a stalwart in the national energy strategy of the UAE. 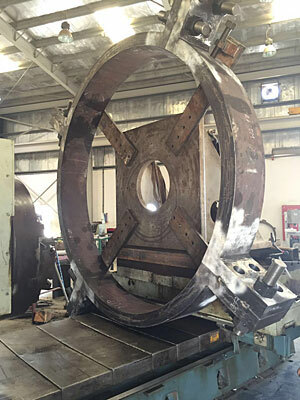 The engineering team at Unique Group designed and manufactured a four-piece ring clamp with a total weight of 3.14 ton. The flange gap measurements were taken after the clamp was mobilised to the site. The clamp lip was then machined to the exact size using the in-situ machining technology. Once the clamp was installed, 150 gallons of sealant was injected to fill the void creating an effective seal. The entire operation was carried out in close coordination with ADGAS policies and procedures. The work was delivered with the highest level of competence, dedication and zeal to help ADGAS with the most viable solution and mitigate the high temperature leak. Unique Group provides comprehensive Under Pressure Leak Sealing services both efficiently and cost effectively, with our skilled engineering team repairing pipeline leakages and pressure vessel systems without any interruption to production. Unique Group’s On-Site Engineering division is committed in keeping up with the ever-competitive market and uses the latest non-destructive repair methods ensuring any unlikely damage to the service equipment is kept to an absolute minimum.